Q. What is the best way to light shelving? A. First off, you have to think about how translucent or opaque the objects are that you’re trying to illuminate. Solid items, like chinaware and books, should be lit from the front. Translucent items, like stemware or art glass, should be lit from behind. 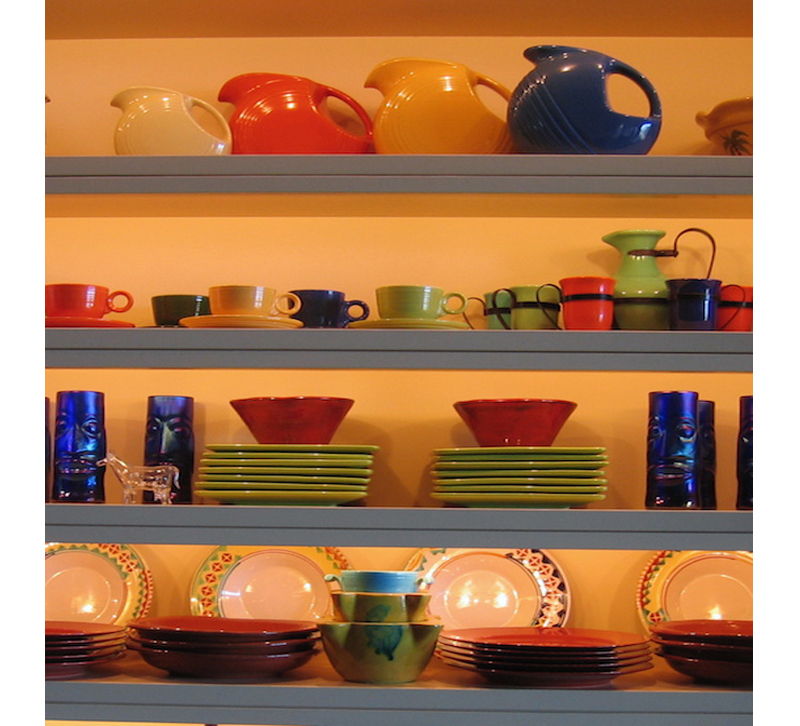 Over the years people have tried many different ways to illuminate shelving. Trying to direct light from the ceiling is a poor choice. The light will hit the top two shelves, leaving the lower shelves to fall into shadow. Plus, the shelves themselves will cast a hard line of light on the shelf below it. Another failed technique is to use glass shelves instead of wooden shelves and then install recessed fixtures at the top. This creates a hotspot on the uppermost shelf where the objects block the light from the lower shelves. Back in the 1980s, linear aluminum extrusions were fitted with runs of halogen or xenon light bulbs to illuminate each of the shelves. These would be mounted towards the front, on the underside of the shelf above the one that was to be illuminated. This did provide even shadowless illumination for the objects for each shelf. The problem was that they created a good amount of heat, used a lot of energy and the bulbs themselves did not last very long. Then, LED linear strip lights came along. The early ones were greenish in color and did not dim very well, if they dimmed at all. Now, just five years later we have LEDs in delicious warm colors, with a high CRI, more consistent dimming…and even the ability to appear to get warmer as they are dimmed, using warm-dim technology. As you’ve heard me say before, choose an LED source in a color temperature that is not too cool. The highest color temperature that I would recommend is 2700K. My personal preference is for 2400K or even 2150K. Also, invest in a product that has a CRI of 90 or higher, so that it will have the color quality of incandescent light. Make sure that you read the manufacturer’s recommendations for compatible dimmers. This will save you a lot of grief. If you have wooden shelves, install a run of linear LEDs above each shelf. You can order them with an aluminum extrusion to hide the light source, or you can install trim along the underside of the shelves. This makes each of the shelves look a little bit more substantial. The best extrusions position the LED lighting at a 45-degree angle so that the light is projected back towards the objects that are to be illuminated. If you are installing the wood trim instead, you can add a triangular linear wood addition on the backside of the wood trim, on which you will install the LED lighting in order to create the 45-degree angle. If you have glass shelves, then you have two options. The first one I feel is a little bit clunky. That would be to clip the extrusions to the front edge of each of the glass shelves. This takes away from the airy feel of the glass. My recommendation would be to install two vertical runs of LED lighting on either side of the shelving. In order for this to work best, the glass shelves should be held back to 23 inches from the façade of the shelving so that there is room to install the LED lighting, as well as some trim board to hide it from view. Sometimes you don’t have to use lighting inside the casework at all. If you mirror the back wall of the shelving unit, it will capture the room’s ambient light. This also helps open the room up, creating the illusion that we are looking through the shelving unit into another room.